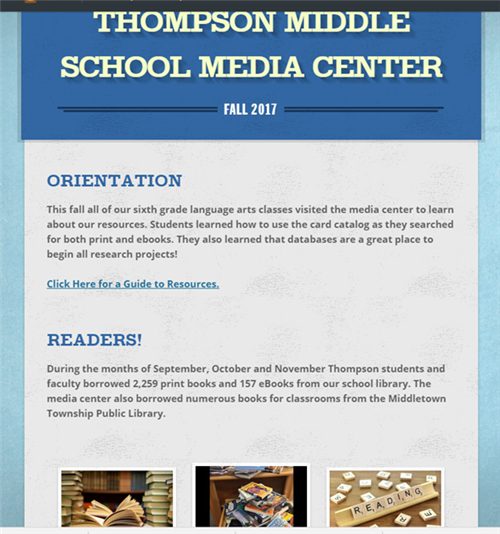 Welcome to the Thompson Middle School Media Center! Please see Mrs. Raymond for the passwords to use these resources from home. contains primary source links and eBooks that you can download. Use the World Book Web to organize your research. Gale Student Resources In Context can help with many different subjects. EBSCO's Explora contains a variety of wonderful resources. Use this link: FollettShelf You can use the word guest as your username and password if you just want to skim through the books online, or you can login in with your computer username and password. (Skip the @middletownk12 part). Further directions on how to borrow and download Follett eBooks. Capstone - A small collection of interactive books. You can also go to the link below to download an app to read books on your Nook, Kindle, phone or iPad. This app does not currently work with Chromebooks. Digital Citizenship: A General Overview for Students, Parents and Educators. A guide to help you to make sure your website is appropriate for research. A valuable resource of films, activities, and links for students parents and educators. Suggestions from your librarian on what to read next! http://www.kidsreads.com/ Book reviews, recommendations, trivia, facts and more! Search Google's growing database of digitized books. If a book is in the public domain (out of copyright), you can view the entire book and download a PDF copy. If a book is copyrighted, you may be able to preview small portions of the book. Access to 1.7 million scanned versions of books, with links to external sources like WorldCat and Amazon. Search over 33,000 free eBooks available for download to your computer and most portable devices. eBooks are available in ePub, Kindle, HTML and simple text formats.